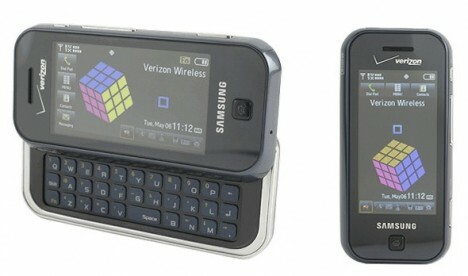 Samsung Glyde is the stylish phone with a full QWERTY keyboard that slides out when is needed, and beautiful 2.8″ touch screen display. It is a phone, and also comes with a music player, camera (2MP), video, internet, navigator, QWERTY Keyboard, speaker phone and features voice commands. The phone weigh 4.1-ounce while measures at size 4 x 2 x 0.7 inches. It is thick but rather compact with midnight blue shell trimmed in chrome-colored plastic. From front, a 2.8-inch touchscreen, an analog Home button, and the ear speaker making up the space, while the 2-megapixel camera lens and LED flash adorn the back. The phone’s thickness is attributed to the QWERTY keyboard, which glides out from behind the front. The quality and smoothness of the spring-loaded sliding mechanism is rather impressive. Inside, the dual-band CDMA (800/1900MHz) phone features stereo Bluetooth and assisted GPS, 3G support and a competent Web browser. It comes in 45MB of built-in flash memory for messages, applications, ringtones, media, and ringtones, though you can add up to 8GB with a microSD card, that supports the latest range of high-capacity cards. Furthermore, the Vibration strength is adjustable. However, the Glyde does not have WiFi. The Glyde’s capacitive touchscreen responds to skin’s ability to carry electricity away from the screen’s electrodes, rather than being pressure sensitive. A stylus or fingernail does not work here. Down side is, the touch screen doesn’t work that well. Until Samsung comes out with a fix, the work around is by zooming in via volume buttons and dragging fingger to scroll vertically and horizontally. Home button underneath the LCD can brings you to the main screen from anywhere in the phone’s menu system. Overall, the menus are clear and the buttons are generally large to be pressed easily.